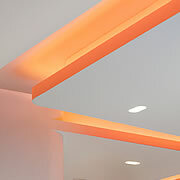 The attractive coving of ceiling and walls may be illuminated in almost any light or brand colour. Two mobile cooking stations and a catering kitchen with hatch guarantee private dining and display cooking of the highest standard. The Lounge is furnished with Italian design furniture and decorated with choice textures in subtle shades. The ambience makes it a perfect retreat for discreet conversations. The Salon may be used as a representation room or press lounge, without the need for a great deal of decoration. Combined with the extensive Studio, the Salon serves as a reception or preparation area for larger events. As an element of the Salon, the Lounge is charmingly appointed with Italian designer furniture and high-quality textures. The interior is rounded out with a terrazzo-like epoxy resin flooring, deep pile carpeting and leather wall coverings which may be reversed via a wall panel. 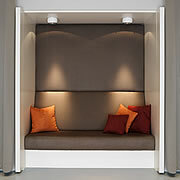 Variable spot lighting and indirect light enhance the Lounge’s atmosphere of privacy. Two mobile cooking stations make every display cooking session or cookery class complete. 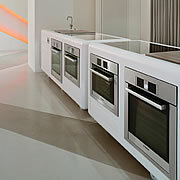 The superb solid surface stations are fitted with induction cooking plates, built-in ovens and built-in steam ovens. They are parked between the two columns of the Salon and have direct power and waste connections. The cooking stations are a live element and an exciting feature at any event. An excellently fitted catering kitchen is situated behind the illuminated window front of the hatch, which can be used either for passing through items or as a bar. The kitchen is equipped with induction cookers, ovens, combi steam ovens, salamander, rechaud, heat lamps, refrigerator and chiller, ice machines, wine cooler and dishwashers. 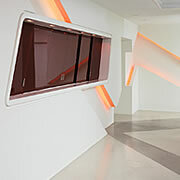 The interior architecture is based on a groove grid system which extends across the floor, walls and ceiling. The grooves in the walls and ceiling are fitted with LED lights which can support practically every corporate design colour. The illuminated coving of the Salon gives the room its striking look. On the window side of the Salon, two superior seating alcoves have been inserted between the panes of glass. This sophisticated piece of carpentry provides seating for two to three people and, where desired, may be hidden behind high partition doors.